The Arrivals board is one of the most desirable features in a TMS. 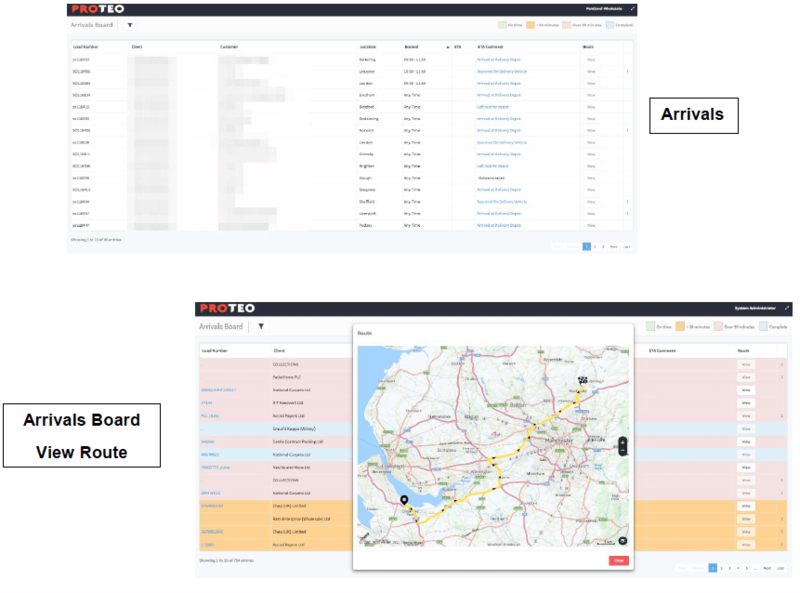 The Arrivals Board is all about visibility for the Haulier, Planner and the Customer and can Integrate with your existing Telematics Solution. As a haulier, it display’s a real-time view of your fleet, resources and the status of all customer orders including all ETA’s, providing a greater operational grip of the business. Since all the information is real time, you and your customers can get a secure view of all their collections and deliveries. This reduces need for frequent phone calls and messages by the customers and strengthens relationships with them and builds confidence in the services. All the information, as it happens, laid out in a comprehensive way for you to act upon. Real time information updates is a key feature of arrivals board. Since all the delivery and collection times are available, you can see at a glance if anything is going to be running late. Track your entire fleet live on your arrivals board. With every driver’s schedule, route, location and destination laid out, you have absolute control over your entire fleet and you can make informed decisions to ensure optimum fleet utility and maximum output. If you are working for a pallet network all consignment updates are also shown with the ETA information so that you and your customers have a single view of all work that is being done with no loss of information. Integrates with all major telematics providers such as Tom Tom, Microlise, Tegois etc. to provide vehicle tracking and driver behaviour data directly into Proteo Enterprise. Track down resources, ETAs, additional charges, arrival times, delays and any other entity on the arrivals board and then plan your next move. Add filters to get highly informative data. Add and save highly configurable views to get insights into every aspect of your fleet operations. You can view the information you need allowing you to focus on what is most important. Your planners can focus on the work that their drivers are responsible for by being able to show their own drivers only. This will ensure that they are able to see and respond to any changes to the ETA. The Arrivals board has been designed to work on your desktop or can be shown on a large screen where the information will automatically scale and the board will rotate showing all information. Add live notes that get updated in real time so that no details are lost and everything is kept track of. The information entered is visible to your customers so that they can be made aware of why something is not running on schedule and plan accordingly. Customers can see the arrivals board to see the status of their deliveries. The Arrivals Board may be viewed in many ways and showing all available data in many formats depending on the individual user requirements.